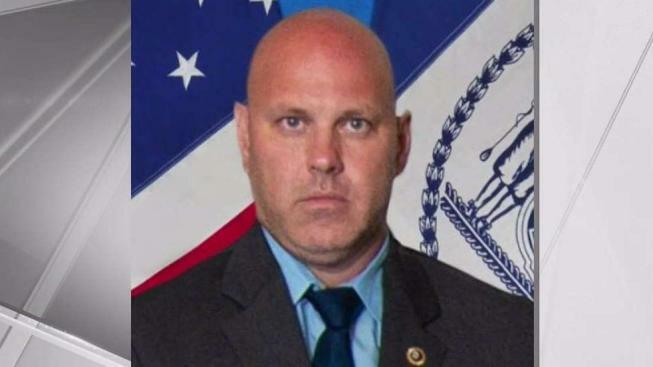 An NYPD detective was shot and killed while responding to a robbery at a cellphone store in Queens Tuesday night, and NYPD Commissioner James O'Neill says it appears to be "an absolutely tragic case of friendly fire." Det. Brian Simonsen, 42, was killed after being hit by gunfire at the T-Mobile store in Richmond Hill. Ray Villeda reports. Det. Brian Simonsen, 42, was killed after being hit by gunfire at the T-Mobile store at Atlantic Avenue and 120th Street in Richmond Hill, according to a preliminary investigation, O'Neill said. Simonsen was a 19-year veteran. Simonsen and his sergeant were working on an unrelated case in the area when they heard the calls come in for a robbery in progress at the store, O'Neill said. At least one 911 caller reported two workers being forced at gunpoint to the back of the store. The detectives got there just as patrol units from the 102nd Precinct arrived. The officers entered the store and saw the suspect emerge from the back, pointing at them with what appeared to be a handgun. "With the suspect advancing toward them, the officers discharged their weapons and retreated out of the store. That was when Det. Simonsen was shot," O'Neill said. Two NYPD cops have been shot while responding to a robbery in progress. Jonathan Dienst reports. "His fellow officers put him in a marked police car and transported him here. The trauma staff did their best to try to save him, and we thank them for that. They were unable to do so," O'Neill added. The sergeant, later identified as Matthew Gorman, who had eight and a half years with the NYPD, was shot in the leg, and was taken to the hospital by a passerby who stopped to help. "Make no mistake about it: Friendly fire aside, it's because of the action of the suspect that Det. Simonsen is dead," O'Neill said. The suspect, a 27-year-old career criminal, was shot multiple times and was taken to Booth Memorial Hospital, where he's listed in stable condition. Sources have identified him as Christopher Ransom. An imitation firearm was recovered at the robbery scene. "This is an absolute tragedy, the worst outcome any police officer or family of a police officer could ever imagine," O'Neill said. "The sympathies and prayers of the entire New York City Police Department are with the family and colleagues of Det. Simonsen tonight." Michael Palladino, president of the Detectives Endowment Association union, called Simonsen "the kind of fellow that led by example, led by his actions," and had leadership skills recognized by fellow detectives. Palladino said of the suspect, "I think we have to ask the question, why is some with such an extensive arrest record out on the street and not incarcerated?" Mayor de Blasio said "it's a difficult, painful night for our city. We lost a very good man." In police radio transmissions from the robbery, a 911 dispatcher is heard telling officers, "That's gonna be a gunpoint robbery at T-Mobile. He's got a duffle bag, he's 5-10, medium build. He said he saw the guy take two employees to the back of the location." Less than two minutes later, a cry is heard amid gunfire: "Attention, shots fired! Shots! Shots fired, shots fired!" The frantic shouting continues, and then: "Central. He's in the store. He's going to the back. Get covered, guys, get covered." "Be advised, I'm shot. Perp is still at the location. Please set up a route. I'm going to Jamaica." Atlantic Avenue was shut down between Lefferts Boulevard and 130th Street as police investigated the scene. At least four bullet holes could be seen in the window of the T-Mobile store, and evidence markers were everywhere. People in the area said they heard the rapid gunfire during the shootout. One man said he almost walked into the middle of the shooting. "There was yelling right in front of the T-Mobile store, then they started shooting," he said. "Then they started shooting, then I ducked. I hid behind something." The NYPD's last line of duty death was in 2017, when 48-year-old Miosotis Familia was shot in the head while sitting in a marked NYPD command vehicle in the Bronx. Officials called it an "unprovoked attack on cops." The suspect, Alexander Bonds, was shot and killed by officers.